*GO TO THE RIGHT SIDE OF THE PAGE AND SIGN UP ON "HOW CAN WE HELP?" The Oakland Giant Farmers Market is largest indoor, year-round, gourmet market serving the finest of local and international products to our valued customers and businesses. We proudly serve the Passaic & Bergen County areas. We are a locally owned full service market offering in-store shopping and catering planning services. We pride ourselves on serving only the finest and freshest fruits and vegetables, poultry, dairy, fish, meat, and deli products to provide all the culinary needs for the shopper who demands fresh ingredients at great prices. Our store is conveniently located in the Copper Tree Mall Shopping center located at 350 Ramapo Valley Road in Oakland, NJ, located near the DMV. We are a stones through away from local highways making your trip to the freshest and largest indoor farmers market in the area a breeze. Our clients include local shoppers from Oakland NJ, Wyckoff, Franklin Lakes, Ridgewood, Ramsey, Mahwah, Riverdale, Pompton Plains, Wanaque, Pompton Lakes, and Ringwood. Our clients also come from other parts of Bergen County like Paramus and even from other counties such as Morris, Passaic County, Essex, Hudson, and Rockland Counties. Come visit us if you are looking for fresh fruits and vegetables, meats, fish, deli meats, gourmet foods, cheeses from around the world, specialty items, ethnic ingredients and much, much more. Each day we create custom gourmet hot foods from both local and international cuisines. We serve hot grill items, hot soups, as well as grab-and-go sandwiches for breakfast, lunch and dinner. We are also wholesalers to many businesses in these counties and welcome the opportunity to provide the freshest wholesale produce, dairy, meats, poultry and fish for our client’s restaurants, deli’s bagel shops, and specialty stores. So call us today so we can set up a time to meet with you to showcase our fine foods that will be sure to enhance your business. Oakland Giant Farmers Market is a one-stop shop for every workplace food occasion, from group lunches to catering planning for big events, and clients. Our expert team pays attention to the latest trends in cuisine, design, and décor to offer you one-of-a-kind choices. We deliver your food on time, set up your buffet, and bring the necessary equipment to keep your hot food hot, and your cold food cold. With our catering planning your event will be set apart from the rest in Bergen County. Offering the freshest wholesale produce to Bergen County! We have an outstanding catering menu to serve a wide array of events from a formal affair to a special private family event and neighborhood gathering of good friends. Our sports catering menu always scores a home run and our birthday party menu is always a great hit with the kids. We always have seasonal and holiday menus online so you can download and submit your order quickly. You can also use the Contact Us Option and request to be on our automatic holiday catering menu email list, pre-order your meals and also order one of our specialty fruit and gift baskets. Our fresh floral department is always on hand to create the perfect arrangement to compliment any event or just provide the final touch to your special shopping experience at our store. Be sure to ask our dedicated staff about any item both foreign and domestic. Our staff is dedicated and knowledgeable so that our consumers can stay informed on preparation and storage requirements, product applications, and product ingredients. We are proud to serve the Bergen County area! Find out who likes what and come to our market and we can help you find everything you need. Someone may want spare Ribs, while another may want Baked Chicken, and yet another may want a Ceaser salad. We have the Solution for that. Simply visit our salad bar and hot food buffet and you’re done. You look like a hero and everyone is happy. So remember, define your shopping needs and simply visit our store to quickly select the items you need. Try our Boars Head deli meats and cheeses and create an outstanding meat and cheese platter with fresh rolls and bread and round it off with some amazing deli salads, pickle trays, mustard, mayonnaise, and oil and vinegar. Your guests will love it. Now top it off with some gourmet cookies and you are guaranteed to be a hit. We have fresh and hot macaroni and cheese, baked chicken, Boars Head Hot Dogs, and fresh hamburger patties to satisfy the hungry little eater in the house. Come on in and create a few unique salad combinations that will serve as a light yet satisfying lunch. Create a Ceasar salad, a mixed green salad, or an arugula and goat cheese salad with cranberries and candied walnuts. Take it home and serve on your decorative platters and salad bowls. Set the table with a seasonal theme and with linen tablecloths and napkins and serve iced green tea with a hint of mint for your beverage, add a fresh bouquet of flowers as your centerpiece and you are ready for a casual mid-afternoon luncheon. Our fresh meats and poultry will come alive and burst with flavor on your grill. Ask our Meat Consultants for marinade suggestions and cooking guidelines. Serve with a few simple side dishes so you take the focus off the flavorful meats. Don’t forget about our specialty burgers, freshly made and ready to pop on the grill. We also have amazing Ribs, Seafood and Kabobs!!! Come on in and try us the next time you’re ready to grill. Our Fish is always fresh! We carry both Farm Raised and Wild Caught fish to meet everyone’s preference. The next time you want to have a fish dinner come on in and select from our wide assortment of whole, fillet, shell fish and fresh whole Lobsters from our Lobster tank. Some Fish Favorites include Shrimp and Scallops Fra Diavolo, Linguini and Clam Sauce, Grilled Salmon, Mussels Marinara, Tilapia Marinara, Stuffed Flounder Almandine, and Grilled Tuna Steaks. Ureshi is the Japanese word for glad or happy. The owners of Ureshi Sushi have been making sushi for over 15 years. Ureshi Sushi make sushi daily with fresh Grade A++ Bluefin Tuna and Scottish Salmon as well as a number of other premium grade fish and seafood. The Sushi chef is always on hand to create the perfect take-out menu for appetizers or a main meal. So come on in and consult with the chef to purchase the best sushi to meet your individual taste or just say hi and grab a few of our freshly prepared grab-and-go Sushi meals from our display case. You can also have sushi catered with a sophisticated menu to meet your catering needs. 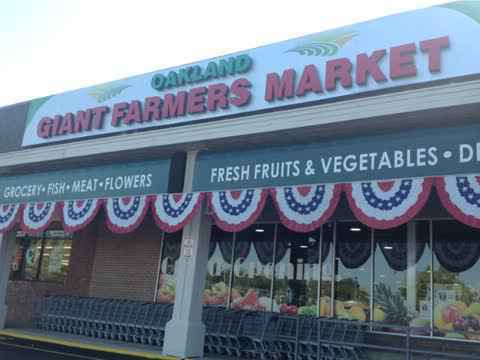 If you are in Bergen County, Oakland NJ or Passaic County, visit The Oakland Giant Farmer's Market Today. We Promise You Won’t Be Disappointed! Call us today for Catering Planning. We offer wholesale produce and meats at our indoor farmers market, proudly serving Bergen and Passaic Counties. We're a year-round indoor farmer's market with the freshest foods and the best savings for you. Other grocery stores can't compete. From our deli meats and our butcher shop to our fresh salad bar and more, we do it right for you. Stop buy and pick up some of our fresh, wild caught fish, our gourmet cheeses, or our various imported pastas and canned goods! Your family will rave over our fresh baked bread.